I am looking to buy a used Charra sidesaddle. I used to have one, but it wad stolen a few years ago. I am ready noe to start training another horse. Please email me if you know if one for sale! Gracias! 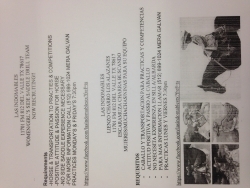 ATTENTION LADIES: Se buscan integrantes para un equipo nuevo en la area de Dallas / Fort Worth, TX. Se requiere que sepan montar y cuenten con caballo propio y transportacion. Para mas informacion porfavor de mandarme un mensaje a mi correo electronico ngarcia1024@gmail.com. Las Rebeldes de Houston les hacen una cordial invitación a todas las niñas interesadas que vengan a formar parte de la primera escaramuza infantil de Houston. Venga y únase a La Familia Rebelde donde los valores familiares y la perseverancia de nuestras tradiciones Mexicanas se viven atreves de nuestro deporte femenil de charrería!! CLASE INICIAL CUANDO: 31 de Julio del 2015 HORA: Montadas 7:00pm – 8:30pm DONDE: 2755 Spears Rd Houston, Texas 77067 **Para más informes por favor de llamar a Christina Camarillo al 281-866-4225!! Most of the problems had to do with weather. There was just too much rain. Judges and stock had to be rescheduled. This is always a problem with outdoor events. The last time the state finals were scheduled, there was a 60% chance of rain. Then it did not rain. I truly agree with Pam, and Javier. This year has been a disaster. you all want money for everything and we do not see nothing in return. this organization is getting worse and worse every year. To Whom it May Concern: I am very concerned that at short notice the location of the estala is being moved from San Antonio to Nevada/Plano TX. Many of our riders must plan well in advance for this expense. With this short notice they can't make it happen. As a person who plans and has other responsibilities, these short notice changes are frustrating and disappointing. This sport will never be what it could be if it is administered in this manner. I was under the impression we wanted this sport to flourish. This makes it so it will not. We act professionally or we fail. Your choice as an organization. My observation Thanks. Hola estamos buscando una entrenadora que pueda venir a amarillo Texas? Por favor mándenme text o llámenme al 806-831-2598 gracias! Hola estoy interesada en ingresar me a un equipo de escaramuza en illinois. Necesito la locación del Segundo Estatal el 5 de Julio. kahalfa@gmail.com o text a 717-434-2790 Gracias por su atentión. estoy buscando una albarda usada pa nina de 2 a 8. favor de mandar mensaje a reyescm29@gmail.com o text 432-847-7526 gracias. ATTENCION CHICAS: muchachas ke kieran estar en un ekipo de escaramuzas y ya sepan montar en la area de Dallas Fort Worth porfavor mandar mensaje a brendasantoyo2010@gmail.com necesitan tener caballo y transporte. The Charros del Sur received the first place ribbon for the Cavalcade Division of the Battle of Flowers Parade. Great work. 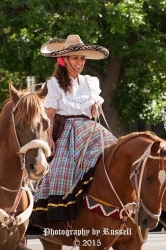 Remember the Charros are participating in the Battle of Flowers Parade tomorrow. They came in second to the Budweiser Clydesdales last year. Every year the crowds appreciate the show. The Charros and Charras really work hard to excel. They should be proud of themselves.